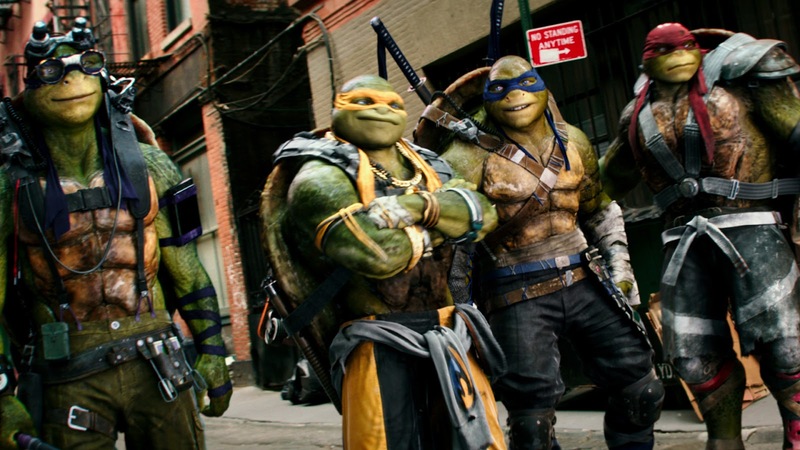 "TEENAGE MUTANT NINJA TURTLES: OUT OF THE SHADOWS" is the sequel to the 2014 hit film "TEENAGE MUTANT NINJA TURTLES." The film is based on the Teenage Mutant Ninja Turtles characters created by Peter Laird and Kevin Eastman and is directed by David Green ("EARTH TO ECHO"). Michael Bay (the "TRANSFORMERS franchise) returns to produce alongside his Platinum Dunes partners Brad Fuller and Andrew Form (" TEENAGE MUTANT NINJA TURTLES"), with Galen Walker and Scott Mednick ("TEENAGE MUTANT NINJA TURTLES") also producing. Also returning for the sequel is Megan Fox ("TRANSFORMERS") as April O’Neil, Will Arnett ("Arrested Development") as Vernon Fenwick and the Turtles: Alan Ritchson as Raphael, Noel Fisher as Michelangelo, Pete Ploszek at Leonardo, and Jeremy Howard as Donatello. Rounding out the cast is Stephen Amell ("Arrow,") as Casey Jones, Tyler Perry ("GONE GIRL", the "MADEA" franchise) as Baxter Stockman, Academy Award nominated actress Laura Linney ("The Big C", "LOVE ACTUALLY") as Chief Rebecca Vincent, Brian Tee ("JURASSIC WORLD") as Shredder, WWE World Heavy Weight Champion Stephen "Sheamus" Farrelly as Rocksteady and Gary Anthony Williams ("THE INTERNSHIP") as Bebop. Meet The Cast Of Power Rangers Dino Super Charge - Camille Hyde: Do You Wear A Lot of Pink? How does Verne know Carmelo Anthony and Alessandra Ambrosio? Catch more Bella and the Bulldogs, only on Nickelodeon and TeenNick! Shabooya! Der charmanteste Talkshow-Moderator der Welt heißt die Kids von Nicky, Ricky, Dicky, and Dawn (die Schauspieler, keine Zicklein) in seiner Sendung willkommen. 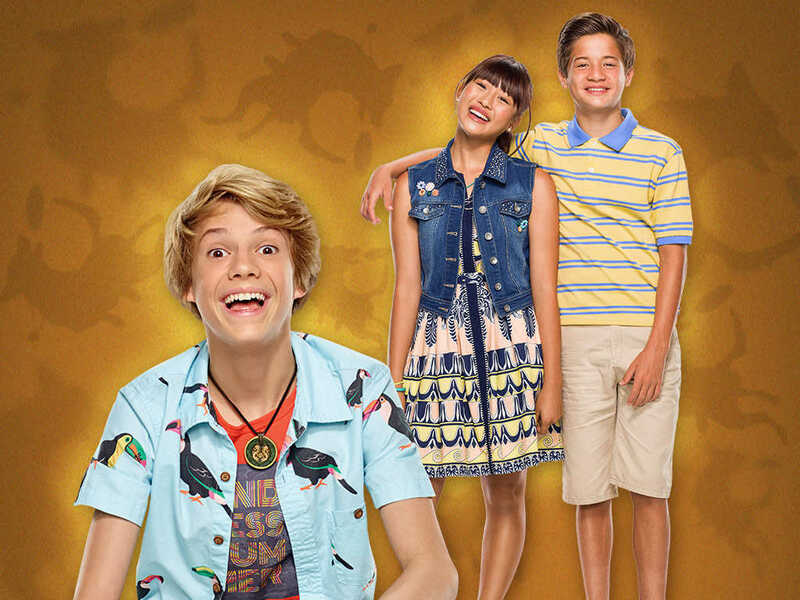 Watch more Nicky, Ricky, Dicky & Dawn on on Nickelodeon and TeenNick! Follow NickALive! on Twitter, Tumblr, Google+, via RSS, on Instagram, and/or Facebook for all the latest Nickelodeon Germany and Nicky, Ricky, Dicky & Dawn News and Highlights! Guckt jetzt die 2. Staffel von Make it Pop auf Nickelodeon an. Watch more Make It Pop on Nickelodeon and TeenNick! Follow NickALive! on Twitter, Tumblr, Google+, via RSS, on Instagram, and/or Facebook for the latest Nickelodeon Germany and Make It Pop News and Highlights! Canción improvisada para Beck - Victorious - Mundonick Latinoamérica. Cat y Robbie inventan una canción para pedirles disculpas a Beck... ¡qué adorables son! Additional sources: Victorious Wiki, holladolla550's channel. Follow NickALive! on Twitter, Tumblr, Google+, via RSS, on Instagram, and/or Facebook for the latest Nickelodeon Latin America and Victorious News and Highlights! 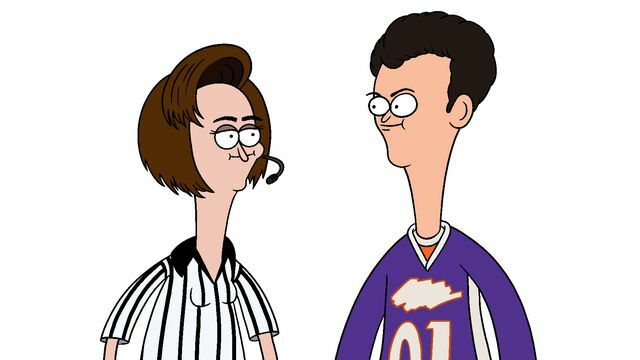 Nick And More is reporting the super rad-awesome news that Nickelodeon USA will be premiering more brand-new episodes of the networks Emmy-nominated original animated series (NickToon) Sanjay and Craig, beginning with the all-new GUTS themed episode which will guest star GUTS hosts Mike O'Malley and Moira "Mo" Quirk, weekdays at 6:00pm ET/PT between Monday 20th and Friday 24th June 2016! In the brand-new GUTS-themed episode of Sanjay and Craig, the dude-snake compete in the Extreme Arena on a road-show version of the classic Nickelodeon action-sports game show, which will see Mike and Mo, who will guest star as themselves, take up their Guts hosting duties once more as Sanjay and Craig work their way through a series of Aggro Crags. Follow NickALive! on Twitter, Tumblr, Google+, via RSS, on Instagram, and/or Facebook for the latest Nickelodeon & Sanjay and Craig News and Highlights! Are you ready for TBT - Throwback Thundermans! Henry Danger's Jace Norman (Henry) and Cooper Barns (Captain Man) dug up Kira Kosarin (Phoebe) and Jack Griffo's (Max) audition tape for The Thundermans! And be sure to check out "Danger & Thunder", a brand-new super-powered hour-long crossover special in which Max and Phoebe Thunderman from Nickelodeon's The Thundermans team up with Kid Danger and Captain Man from Henry Danger, premiering soon, only on Nickelodeon USA! In the video, Jack and Kira also reveal interesting facts about The Thundermans, including that Jack's character, 'Max', was originally called 'Jack'! 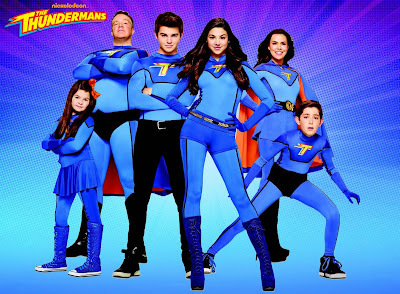 Check out these super video clips featuring scenes from the unaired pilot episode of Nickelodeon's hit original comedy series The Thundermans, featuring Tyler Peterson as 'Jack Thunderman'! Cam Newton Visits The White House For New Nickelodeon Show, "All In With Cam Newton"
Carolina Panthers quarterback Cam Newton has scored big for his brand-new Nickelodeon series that launches Friday! Newton took 10-year-old Rosie Smolowitz to the White House for All In With Cam Newton, Nickelodeon's brand-new adventure-filled docu-series in which the NFL star helps kids fulfill some of their dreams, to explore Rosie's aspiration to one day become president. During their visit, Cam and Rosie got to interview Michelle Obama. "Don't let anybody stop you from your dreams, because I could have never dreamed of living here," Mrs. Obama told Smolowitz during the interview. "But here I am, the first lady of the United States. And Cam, you reached your dreams, for sure." Mrs. Obama and Newton also made a point to promote a healthy and active lifestyle. Newton was one of the first celebrities to join Team FNV, a fruits and veggies marketing effort powered by the Partnership for a Healthier America, of which the first lady is honorary chair. Joanna Rosholm, the first lady's press secretary, said that Michelle Obama highlighted "Every Kid in a Park," a White House initiative in partnership with the U.S. Department of the Interior to allow all fourth-graders and their families to experience the country's national parks, forests, public lands and waters, free of charge. 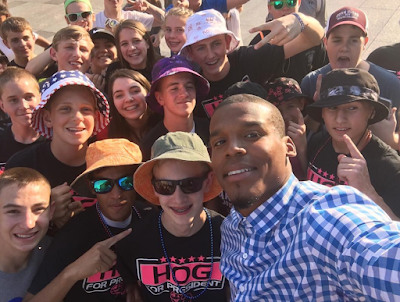 Cam Newton takes a selfie with fans whist visiting Washington DC for "All In With Cam Newton". Photo: cameronn46, via Terez Owens. Mrs. Obama, Newton and Rosie also talked about the Charlotte, North Carolina, youngster's dream of becoming president. The interview was conducted last Tuesday in the Rose Garden. Nickelodeon says the episode will air during the summer. Hosted by Newton, All in with Cam Newton pairs kids with unique mentors who lend their expertise in a variety of fields, such as gymnastics, animation, basketball and even local city government. Produced by Magical Elves, the 20 episode series will air every Friday night at 8:00pm ET/PT from Friday 3rd June 2016, only on Nick USA! Additional sources: Associated Press via Yahoo! News and CBS News, ESPN. Hurray for play! On Worldwide Day of Play, Nickelodeon shows their dedication to all things active and playful! Nick's first stop on their Worldwide Day of Play 2016 tour was Las Vegas! Nick Radio DJ J-Boogie played the hits, the PAW Patrol pups played it safe, and everyone else just flat-out played! Check out the slime-tastic pics below! Nickelodeon has still got stops in Oklahoma City, Kalamazoo, and Chicago leading up to their big day of play on Saturday 17th September 2016. So jump, dance, run, swim, and laugh as Nick kicks off all the fun! For the latest up-to-date information about Nickelodeon's Worldwide Day of Play 2016, visit nick.com/play! The Hungarian children's television news blog Gyerek-Világ is reporting the exciting Nickelodeon International news that Nickelodeon Central and Eastern Europe (CEE) will start to premiere and show Nickelodeon's brand-new original comedy series Game Shakers on Monday 6th June 2016! Nickelodeon Central and Eastern Europe will debut the one-hour series premiere of Game Shakers on 16:45 on Monday 6th June 2016. Following the shows debut, Nick CEE will continue to premiere more brand-new episodes of Game Shakers weekdays at 16:45 from Tuesday 7th June 2016. Created by hit-maker Dan Schneider (Veszélyes Henry, iCarly, V mint Viktória, Sam & Cat, Zoey 101, Drake & Josh, Kenan & Kel), Game Shakers follows a pair of 7th grade girls, Babe (Cree Cicchino) and Kenzie (Madisyn Shipman), who, after creating a wildly successful mobile game app called Sky Whale for a science project, start a gaming company in Brooklyn called Game Shakers with their friend Hudson (Thomas Kuc). But when superstar rapper Double G (Kel Mitchell, Kenan & Kel, All That, Good Burger), a super successful, unpredictable rapper, finds out the girls used one of his songs in their game without licensing it, he threatens to sue them for all he is owed! To make things right, Babe and Kenzie decide to make the rap superstar their business partner and hire his son, Triple G (Benjamin Lil P-Nut" Flores, Jr, A Hathaway kísértetlak), as a game consultant. 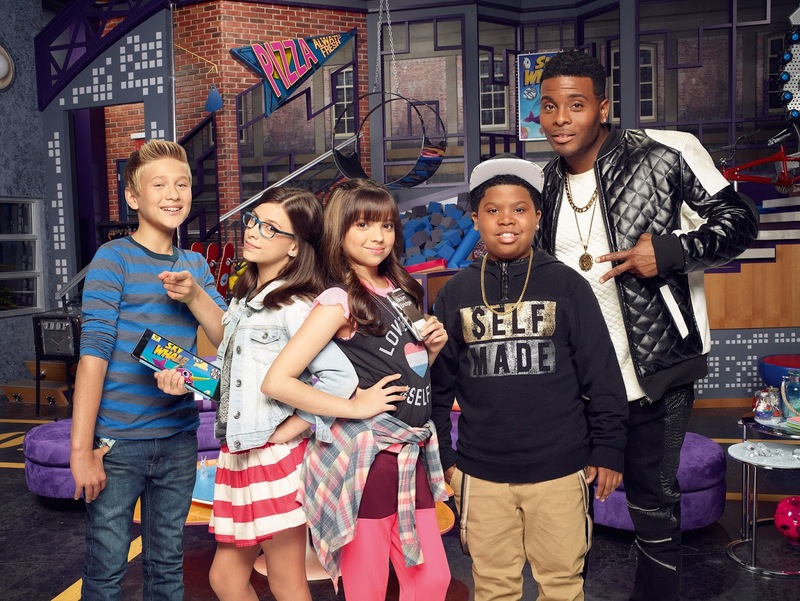 Together, Babe, Kenzie, Hudson, Triple G and Double G will work to make Game Shakers a huge success in the gaming world! Will this new deal be a high score or a game over for Babe and Kenzie? Let the games begin! To celebrate Nickelodeon Central and Eastern Europe debuting Game Shakers in June 2016, Nickelodeon Hungary's official website, nickelodeon.hu, has launched the channels' official Game Shakers show website, which features information about Nick's brand-new sitcom! Follow NickALive! on Twitter, Tumblr, Google+, via RSS, on Instagram, and/or Facebook for all the latest Nickelodeon Central and Eastern Europe and Game Shakers News and Highlights! The Hungarian children's television news blog Gyerek-Világ is reporting the PAWsome news that Nickelodeon Central and Eastern Europe (CEE) will premiere the brand-new Nickelodeon Original Movie Rufus on Sunday 12th June 2016 at 16:20! Following the films debut, Nick CEE will encore Rufus on Sunday 19th February 2016! Follow NickALive! on Twitter, Tumblr, Google+, via RSS, on Instagram, and/or Facebook for the latest Nickelodeon Central and Eastern Europe and Rufus News and Highlights! 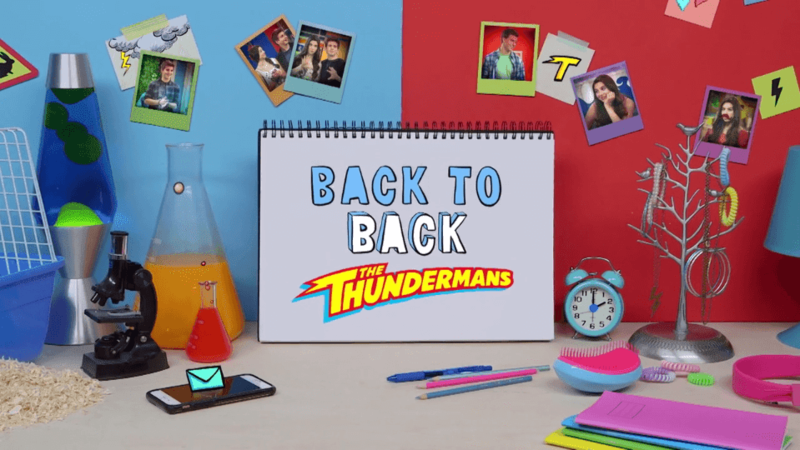 Get Set For "Thunder Month" This June On Nickelodeon UK! Alert! Alert! Incoming Thunder Month Weather Report! Get set for a whole month of The Thundermans this June on Nickelodeon UK & Ireland/HD! Expect storms, extreme heat, and strong winds throughout the month. As we move into the weekends, temperatures will start to rise with Max themed episodes of The Thundermans. Things will go from hot to su-super cool as Nick continues through to their Phoebe themed weekends. And the end of the month will bring some unsettled conditions for Dr. Colosso. Thunder Month is taking the country by storm! It's a whole month of The Thundermans, starting Monday 6th June 2016 from 5pm-6pm, only on Nickelodeon UK & Eire/HD! To celebrate Nickelodeon USA premiering Lost in the West part three on Monday 30th May 2016, as part of Nick's Memorial Day Weekend line-up, Nick USA has unveiled a super sneak peek preview of the third part of the networks brand-new three-part original television movie, which you can watch in the fantastic video clip here on nick.com! In Nickelodeon's all-new original TV movie best bros Chip (Caleb Thomas, Chase Champion) and Dave (Niko Guardado, Nicky, Ricky, Dicky & Dawn) saddle up for a whirlwind adventure when Chip's latest invention accidentally transports them back in time to the Wild West! Not only will they have to save their hometown, fight off evil outlaws and avoid changing the future, they've also got to make it back from 1885 to the present in time for the Homecoming Dance! In order to figure it out, they'll need help from friends in both timelines, including Luna, Lisa (Fallon Smythe), and Texas Jane (Morgan Higgins). Will their cowboy skills stand the test of time? Will their actions in the past have a serious effect on the present? Only time will tell! In Lost in the West part 3, Dave must rescue his stepbrother when Chip gets stranded in the Wild West; the boys get help from some unlikely allies. In Nick USA's super sneak peek from Lost in the West part three, "Alternate Timeline", Lisa and Dave get sent back to the future without Chip and they end up in an alternate timeline! Lost in the West also stars Jade Zafra, Benjamin Nathan and Tony Rodriquez, Verónica Polo as Coach, Jimmy Shaw as Gabby, Kathleen Renish as Mrs. Cole, House of Anubis star Alex Sawyer, and Mark Schardan as Doc Duvalier, James Eeles, Kamran Darabi-Ford - the antagonists (villains) of the movie. 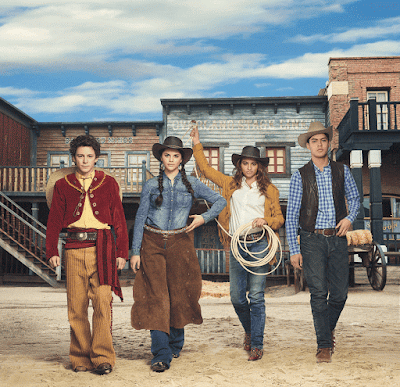 Visit Nick.com for more information about the brand-new Nickelodeon Original Movie, character bios for Chip, Dave, Texas Jane, Luna and Lisa, and more awesome video clips, including parts one and two! Follow NickALive! on Twitter, Tumblr, Google+, via RSS, on Instagram, and/or Facebook for the latest Nickelodeon and Lost in the West News and Highlights! Alex and Maia Shibutani are going Hollywood! The reigning U.S. Ice Dance champions headed to Los Angeles earlier last week to shoot an upcoming episode of Nickelodeon's hit original live-action comedy series Nicky, Ricky, Dicky & Dawn! While they didn't reveal anything about their roles, or the episode itself, Alex and Maia shared a few fantastic photos on Instagram and a some fun videos on their official Snapchat. 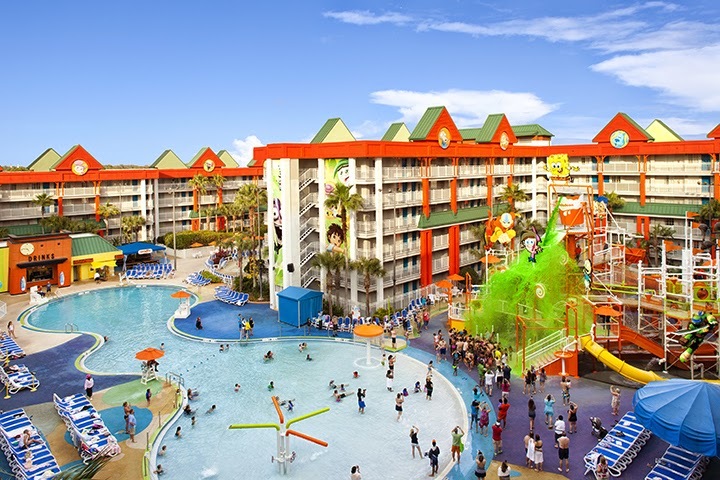 After more than a decade of fulfilling childhood dreams, Nickelodeon Suites Resort in Orlando, Florida will slime someone for the very last time on Tuesday night. 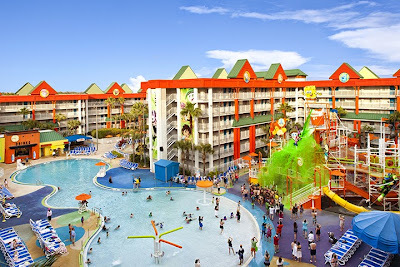 The hotel, east of Walt Disney World, will officially become the Holiday Inn Resort Orlando Suites and Waterpark on Wednesday 1st June 2016, following Nickelodeon and Urban Commons mutually agreeing to not extend their partnership. "To me it's kind of sad because that's what the kids love," said Lynne Lopez of Miami to the Orlando Sentinel. "I think the kids come here so they can experience the characters." It was Lopez's second time staying at the hotel. She didn't know when she initially booked the weekend trip she'd also be saying goodbye. Since last year, the 777-room property has undergone a major renovation, including the slow removal of everything green and orange, the colors that clearly distinguished the hotel as a Nickelodeon experience. The $30 million renovation includes a total refurbishment of the lagoon pool deck, updating suites to a more neutral color palette and the end of all Nick experiences. Most of the rooms have already been updated. Those that haven't will be completed by the end of the year. Nickelodeon experiences like dinner with the Teenage Mutant Ninja Turtles, mass slimings on the pool deck and live performances of the networks hit Double Dare game show were originally scheduled to end in April 2016. Robert Soto, the hotel's director of entertainment and recreation, said the official rebranding was delayed to make Memorial Day weekend the hotel's final hoorah. As part of the renovations, Teenage Mutant Ninja Turtles Laser Lockdown is being rebranded as the Batman Laser Challenge, in which challengers having to navigate through a web of lasers as they train with Batman to protect the citizens of Gotham City from The Joker. 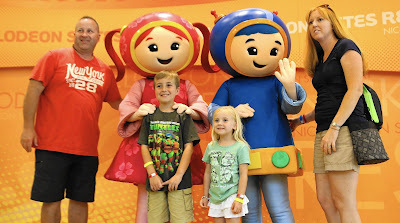 "We have seen lifelong Nickelodeon fans make the trek out here to experience Nickelodeon one more time here in Orlando," said Soto. Although Memorial Day has historically been a busy weekend for the hotel, fans flocked to be part of the final blowout, Soto said. He said the hotel was almost completely booked as of Friday night. Soto, who has worked at the hotel for the last decade, said it's a bittersweet experience to say goodbye to beloved characters like SpongeBob SquarePants and Dora the Explorer. Bidding farewell to other key Nick experiences is equally sad, said Soto. "We have slimed and pied countless kids and families throughout the years," he said. Employees who played characters will now be part of new entertainment activities under the Holiday Inn banner, said Soto. Some people staying at the hotel this weekend were experiencing the hotel's messy brand of fun for the first time. "Slime. I got to get the slime," said Samuel Boone, who came up from Miami to celebrate his stepdaughter's birthday. "I drove up here to get slimed. Four hours to get slimed." Nickelodeon Suites Resort will hold their last mass sliming on Tuesday 31st May 2016 on the Lagoon Pool Deck. When first learning of plans to close the Nickelodeon Suites Resort, guests flooded the hotel's phone lines with questions about the rebranding, with a important question arising from those most familiar with the hotel, which celebrated its 10th anniversary last year: What will happen to the Nickelodeon Time Capsule, originally buried there in 2005? 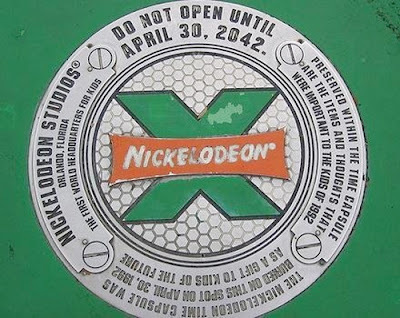 "The time capsule will be moved to a Nickelodeon private business office and studio that is currently under construction in Burbank, Calif.," Deanna Padilla, the hotel's marketing manager, assured fans. The exact date for the move hasn't been determined, she said. 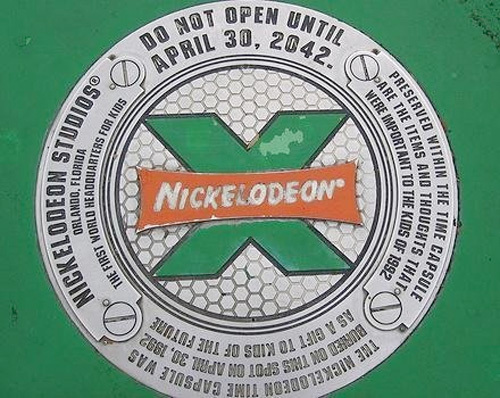 The capsule was originally sealed April 30, 1992, and buried at Nickelodeon Studios at Universal Orlando. When that closed it was relocated to the Nickelodeon Hotel. Contents of the capsule include rollerblades, Twinkies, a copy of Nickelodeon Magazine and a jar of Gak, a gooey child's toy popular at the time, among other things. You can watch a fantastic video featuring the original burial of the Nickelodeon Time Capsule at Nickelodeon Studios at Universal Studios, Orlando, below. Keeping with the original plan, the capsule will be opened on April 30, 2042. Although the Nickelodeon Suites Resort in Orlando, Florida will be closing, Karisma Hotels & Resorts and Viacom International Media Networks (VIMN) recently opened Nickelodeon Hotels & Resorts Punta Cana, Nickelodeon's first-ever international hotel property, which provides both non-stop family entertainment and Karisma's renowned Gourmet Inclusive® Experience. 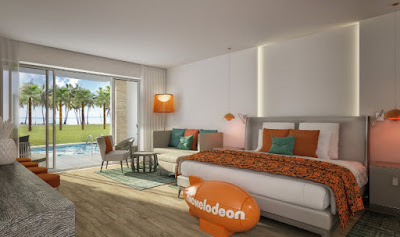 Nickelodeon fans can reserve their hotel rooms today at 1-844-SEE-NICK and www.nickresortpuntacana.com. 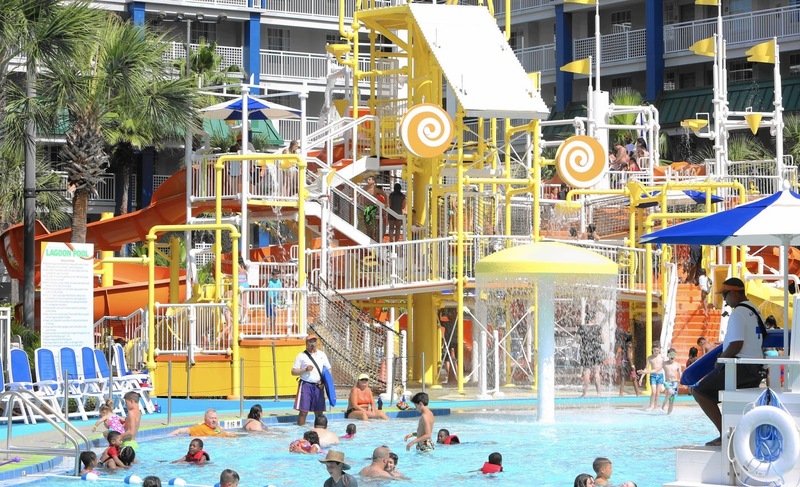 Additionally, developer Kam Sang Co. recently announced plans to build the Nickelodeon Resort Hotel, a new 600-room, four-diamond resort on 10 acres with an expanded pool area, in Garden Grove in Orange County, California. Have you ever visited or stayed at the Nickelodeon Suites Resort in Orlando, Florida? Tell NickALive! your Nickelodeon Hotel memories on Twitter, Tumblr, Google+, Instagram, and/or Facebook! To celebrate Nickelodeon USA premiering Lost in the West part two on Sunday 29th May 2016, as part of Nick's Memorial Day Weekend line-up, Nick USA has unveiled a super sneak peek preview from the second part of the networks brand-new three-part original television movie, which you can watch in the fantastic video clip here on nick.com! 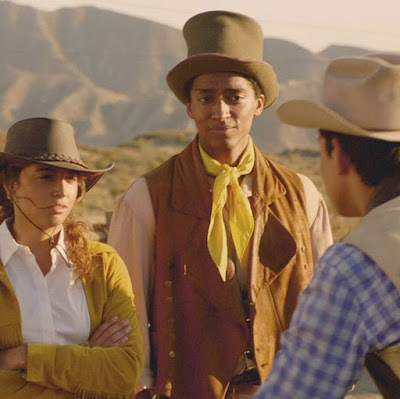 In Nickelodeon's all-new original TV movie best bros Chip (Caleb Thomas, Chase Champion) and Dave (Niko Guardado, Nicky, Ricky, Dicky & Dawn) saddle up for a whirlwind adventure when Chip's latest invention accidentally transports them back in time to the Wild West! Not only will they have to save their hometown, fight off evil outlaws and avoid changing the future, they've also got to make it back from 1885 to the present in time for the Homecoming Dance! In order to figure it out, they'll need help from friends in both timelines, including Luna, Lisa (Fallon Smythe), and Texas Jane. Will their cowboy skills stand the test of time? Will their actions in the past have a serious effect on the present? Only time will tell! In Lost in the West part 2, Chip and Dave return to the Wild West to fix the mess they caused the first time around; the boys reunite with their old friends to try and outwit the Purple Hat Gang. In Nick USA's super sneak peek from Lost in the West part two, "Purple Hat Man", a man in a purple hat causes some trouble in the saloon, but Dave puts an end to it! Lost in the West will also star Morgan Higgins, Jade Zafra, Benjamin Nathan and Tony Rodriquez, Verónica Polo as Coach, Jimmy Shaw as Gabby, Kathleen Renish as Mrs. Cole, and James Eeles, Kamran Darabi-Ford, Mark Schardan as the antagonists (villains) of the movie, and House of Anubis star Alex Sawyer. 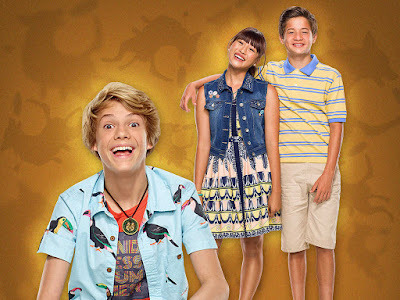 Visit Nick.com for more information about the brand-new Nickelodeon Original Movie, character bios for Chip, Dave, Texas Jane, Luna and Lisa, and more awesome video clips! Follow NickALive! on Twitter, Tumblr, Google+, via RSS, on Instagram, and/or Facebook for the latest Nickelodeon, Hey Arnold! and The Splat News and Highlights! Tune into the season finale of Eu Sou Franky, premiering Friday 27th May 2016 at 19h, only on Nickelodeon Brazil (Brasil)! Watch more Breadwinners on Nickelodeon and Nicktoons! Follow NickALive! on Twitter, Tumblr, Google+, via RSS, on Instagram, and/or Facebook for the latest Nickelodeon UK, Nicktoons UK and Breadwinners News and Highlights! Watch the new Bebop & Rocksteady trailer for Teenage Mutant Ninja Turtles: Out of the Shadows! To celebrate the launch HYPE's brand-new Teenage Mutant Ninja Turtles collaboration collection, HYPE will be hosting a exclusive "HYPE x Turtles" launch party at Boxpark Shoreditch in London on Friday 3rd June 2016! HYPE's "HYPE x Turtles" launch party will feature DJ's, limited edition giveaways, FREE drinks courtesy of 55 Above Vodka + Red Bull, FREE pizza and the TMNT x HYPE Grabber Machine. Attendees will also get to meet and greet the Heroes in a Half Shell and friends, and the first 50 guests will receive an exclusive limited edition TMNT goodie bag! For Guestlist Entry, simply write your name on the events official wall here on Facebook! Guests are advised to arrive early to avoid disappointment. Follow the event and collection on social media using #HYPEXTURTLES! 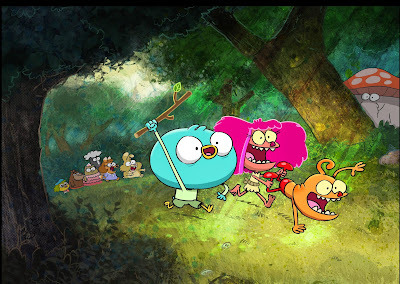 Viacom (NASDAQ:VIAB)(NASDAQ:VIA), the parent company of the Nickelodeon brand, today announced the renewal and expansion of its distribution agreement with Cox Communications for carriage of Viacom's media networks across Cox's subscriber base. Philippe Dauman, Viacom Executive Chairman and Chief Executive Officer (CEO), said, "Cox has consistently been a leader in offering advanced features and services to their subscribers, and Viacom's networks are favorites among those audiences who consume programming on digital devices, whenever and wherever they choose. Viacom and Cox have worked together for many years to provide industry-leading offerings, and are pleased to continue our strong relationship for many years to come." 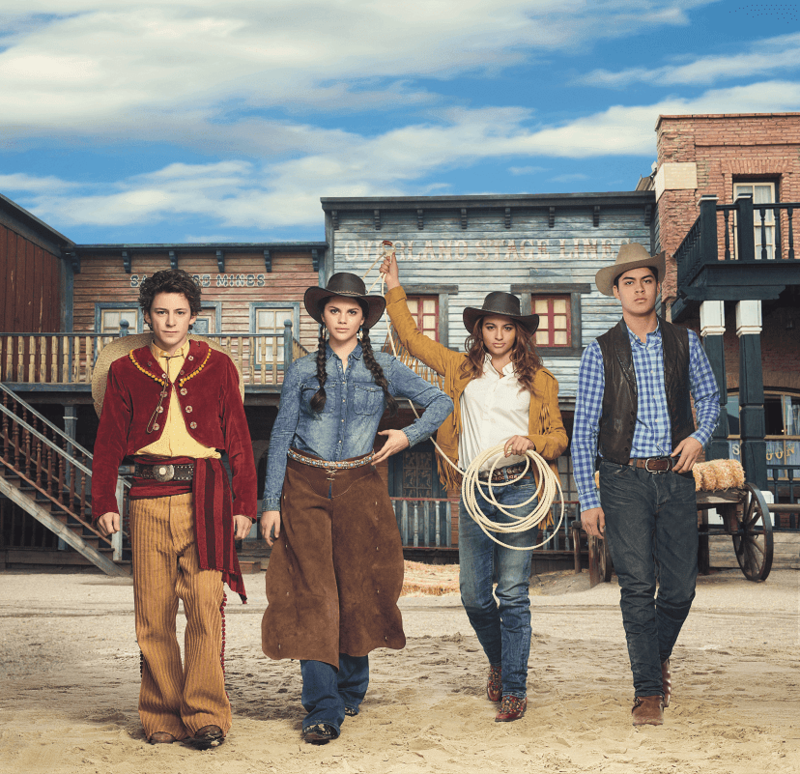 Two time-traveling stepbrothers saddle up for a crazy Wild West adventure in Nickelodeon's all-new three-part original TV movie, Lost in the West, debuting consecutively on May 28, 29 and 30 at 8 p.m. (ET/PT). Starring Caleb Thomas (Modern Family), Niko Guardado (Nicky, Ricky, Dicky & Dawn), Fallon Smythe and Morgan Higgins, the trilogy follows two siblings who get transported back in time to 1885 after one of them accidently invents a time machine. Lost in the West centers on polar opposite stepbrothers, Chip (Thomas), an all-around tech genius who lacks self-confidence, and Dave (Guardado), a charismatic ladies' man with more brawn than brains. Their otherwise ordinary lives take an extraordinary turn when Chip's latest invention accidently lands them back in time to the Wild West. The duo soon become entangled in a thrilling adventure as they fight off evil outlaws to save their hometown. When their actions in the past have time-altering repercussions, Chip and Dave enlist the help of friends from both time periods, including Luna, Lisa (Smythe) and Texas Jane (Higgins), to avoid changing the future and make it back to the present in time for their school's Homecoming Dance. Nickelodeon talks cartoons all the time on the Nickelodeon Animation Podcast. Hosted by Hector Navarro, the podcast gives voice to creators and talent from inside and outside of Nickelodeon who brought to life some of the most innovative, hilarious, and heart-tugging animation in the history of television. Nick Animation also talks with artists about their life stories, career stories, and the inspirations behind the stories of their iconic cartoons. Saban Brands has released the official logo (seen below) of Power Rangers Ninja Steel, the 24th season of the popular Power Rangers franchise! Power Rangers Ninja Steel is the latest in the long line of Saban's Super Sentai adaptation. Nickelodeon USA will start to premiere and show the new season in early 2017, shortly after Power Rangers Super Dino Charge finishes. Saban's Power Rangers Ninja Steel starts deep in space, where Zircon is the reigning champion of the most popular intergalactic game show in the universe, and monsters battle to prove who is the mightiest warrior. Zircon is determined to become invincible by controlling the mythical Spirit Crystal, which contains six supernatural Ninja Power Throwing Stars. The only thing standing in his way is a new team of heroic teenage Power Rangers who possess the Spirit Crystal. The evil Zircon sends his warrior contestants down to Earth to steal the Crystal, where each epic battle against the Rangers is broadcast throughout the universe. Together, the Rangers must master their arsenal of Throwing Stars, Zords and Megazords, each made of legendary ninja steel, in order to stop this evil threat and save our planet from destruction. Saban's Power Rangers Ninja Steel logo not only incoprorates the main shurkien logo from its Japanese counterpart, Ninninger, but also has a space looking background to it. This lines up with the "intergalactic game show" section on the summary. Saban also confirmed that their partnership with Nickelodeon is continuing through 2018, so Power Rangers isn't going anywhere for the foreseeable future. This will keep Power Rangers on Nickelodeon till the franchises 25th anniversary and the release of the bid budget movie from Lionsgate. The summary itself is intriguing, baring little resemblance to Shuriken Sentai Ninninger, Toei's 39th ninja-themed Super Sentai special effects series in Japan, which tackled a family legacy and ninja school while battling to become, "the last ninja." Here, the villains seem to be the ones in competition with the Rangers caught in the middle. The train-themed Ressha Sentai ToQger series aired from February 2014 to February 2015, but Saban Brands has not announced plans to adapt that series. 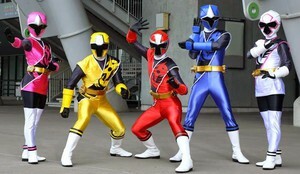 Saban Brands also did not adapt the 2012 series Tokumei Sentai Go-Busters. Power Rangers Dino Super Charge, the current 23rd season of the Power Rangers franchise, premiered on Nickelodeon USA in January 2016. Both Power Rangers Dino Super Charge and Power Rangers Dino Charge before it are based on Toei's Zyuden Sentai Kyoryuger series. The 40th Super Sentai special effects series, Dōbutsu Sentai Zyuohger, premiered in Japan on February 14. The show is getting a film in Japan in August. Sources: Anime News Network, Den of Geek, IGN Snapchat, The Tokusatsu Network. Nickelodeon UK, the number one commercial kids TV network in the UK, has announced the exciting news in the following press release that Nick Jr. UK and Ireland, Nickelodeon UK's top-performing preschool channel, will launch Digby Dragon, a brand new CG-animated preschool series based on original work from Sally Hunter (Humphrey's Corner), with the world premiere on Monday 4th July 2016 at 4:30pm, with a week of new episodes! 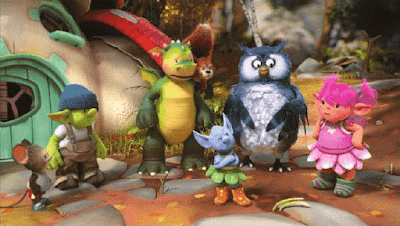 Following the week of new episodes, Digby Dragon will continue to air weekdays at 4:30pm on Nick Jr. UK & Eire. In the premiere episode "Dragon Day," it's the best day of a Dragon's year, but for Digby it's a reminder that he hasn't learnt to fly far yet. Luckily, with the help of Grumpy Goblin and some fairy dust from Fizzy Izzy, Digby manages to soar across the sky. Although it is not the smoothest of flights or most elegant of landings, Digby is delighted that he's managed to fly further than ever before. Online at nickjr.co.uk, parents and children can discover creative activities, find out more about Digby Dragon, as well watch exclusive clips from the show. 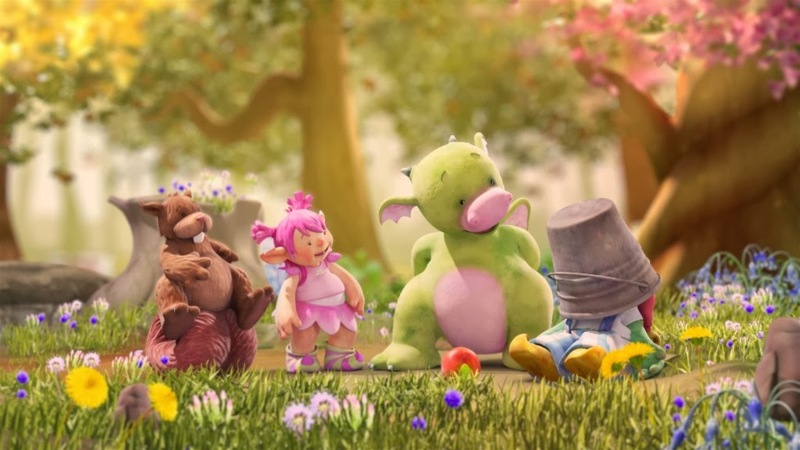 Commissioned by Nickelodeon UK and produced entirely by Blue-Zoo Productions at its central London studio, the CGI show promises to be the latest in a long line of hits from the studio behind Olive the Ostrich, Tree Fu Tom, Q pootle 5 and Alphablocks. The series has been funded through an Enterprise Investment Scheme along with presales and advances. Nickelodeon & Viacom Consumer Products (NVCP) will represent Consumer Products for the property in the UK and Ireland, with Aardman Animations representing the property's international TV, DVD and digital sales. The series has also been acquired by Nick Jr. USA, Nick Jr. Australia & New Zealand and Nick Jr. Latinoamérica, and will also air on ZDF/KiKa in Germany and S4C in Wales. Digby Dragon is based on original work from Sally Hunter, creator of the celebrated preschool property, Humphrey's Corner, and will air weekdays on Nick Jr. at 4:30pm. Where every day's an adventure, Nick Jr. is a top-performing commercial pre-school entertainment brand in cable and satellite homes. Launched in 1999 as the world's first channel dedicated to pre-school children, Nick Jr.'s programming includes beloved shows Paw Patrol, Dora and Friends: Into the City!, Peppa Pig, Lily's Driftwood Bay and Blaze and the Monster Machines. Online, clips, games, exclusive activities and downloads are all available at nickjr.co.uk Viewers also have the opportunity to catch up with the schedule through Nick Jr. +1. Nick Jr. is available on Sky 615, Virgin 715, through BT Vision and TalkTalk channel 318. Follow NickALive! on Twitter, Tumblr, Google+, via RSS, on Instagram, and/or Facebook for the latest Nickelodeon UK, Nick Jr. UK and Digby Dragon News and Highlights! Watch the exclusive premiere of the second season of Yo Soy Franky on Friday 27th May 2016 on Nick Play, three days before it premieres on TV on Monday 30th May 2016 at 7pm on Nickelodeon Mexico and Nickelodeon Colombia and at 8pm on Nickelodeon Argentina and Nickelodeon Venezuela!